Oct. 2, 2012 - PRLog -- Orlando, Fl. 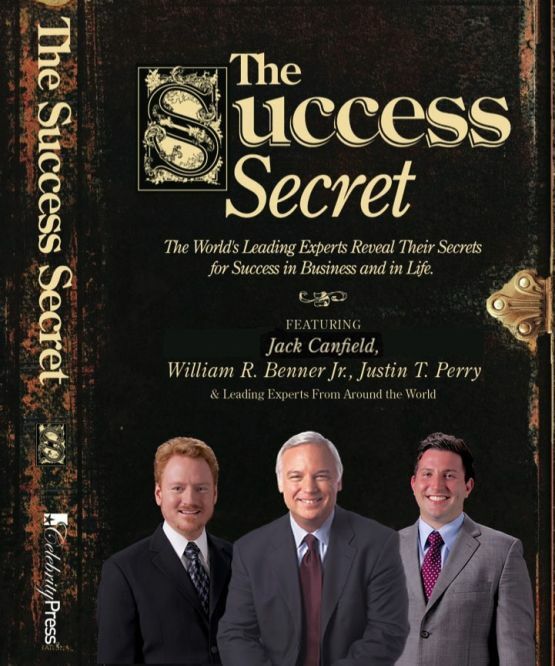 – William Benner, President and CTO of Pangolin Laser Systems and Justin Perry, COO, have joined a select group of the world’s leading experts from a variety of industries, along with best-selling author Jack Canfield, named by Time magazine as the "Publishing Phenomenon of the Decade," to co-author the book titled The Success Secret, The World’s Leading Experts Reveal Their Secrets for Success and Life. The book was released by CelebrityPress™ - a leading business book publisher. On the day of release, The Success Secret reached best-seller status in seven Amazon.com categories - The book reached best-seller status in the Business Skills, Communication Skills, Direct Marketing, Best Entrepreneurship, Marketing and Sales, Marketing, Small Business & Entrepreneurship categories. In addition to having received more than 20 international awards for technical achievement, products invented by William and manufactured by Pangolin are currently used by some of the best-known entertainment and technology companies in the world, including Walt Disney World, Universal Studios, DreamWorks pictures, Boeing, Samsung and Lawrence Livermore Labs. William holds numerous issued and pending US and International Patents, and has received personal letters of commendation from U.S. President Ronald Reagan and Florida Governor Bob Graham. He has articles published in the SMPTE Journal, The Laserist, LaserFX, EDN magazine and Motorola's Embedded Connection magazine, and is co-author of the best-selling business novels Game Changers, Win, and The Only Business Book You'll Ever Need. William has also been featured on NBC, ABC, CBS and FOX television affiliates. Justin oversees the company’s general business, financial, and marketing efforts. In addition, he has assisted in the expansion of the Pangolin’s distribution networks, working with clients around the world to expand the markets served by Pangolin’s laser-display and text messaging products. Justin is an alumnus of the University of Central Florida’s School of Business Administration, where he studied Marketing and Finance. His internships included working with the national automotive firm J & L Marketing, where he participated in designing, developing and launching automotive marketing campaigns for companies including BMW, Mercedes Benz, Jaguar, Chrysler, and General Motors. After such a successful release, William Benner and Justin Perry will be recognized by The National Academy of Best-Selling Authors®, an organization that honors authors from many of the leading independent best-sellers lists. To learn more about William Benner and Justin Perry visit, www.pangolin.com. Pangolin is a Multi-national Organization, having offices in the United States, Central Europe and Mainland China. Pangolin software is used by major theme parks such as Disney World, Universal Studios, and Six Flags; major motion picture companies such as 20th Century Fox and DreamWorks pictures; high-tech companies such as PC Magazine, Boeing, and Lawrence Livermore Labs; and top-named musical talent including Madonna, Drake, Usher, Metallica, the Black Eyed Peas, Jennifer Lopez, Shakira, Jean Michel Jarre, DJ Tiesto, Swedish House Mafia, Justin Timberlake and many others. : Pangolin Laser Systems Inc.